Bastille Day, also known as French National Day, commemorates the storming of the Bastille which began the French Revolution. In essence, it’s France’s version of July 4th and is celebrated with the largest regular military parade in Europe as well as fireworks, concerts, and balls. I started celebrating Bastille Day by making French pastries the summer after I studied abroad in Paris. I had been looking for an excuse to try a few recipes out of a cookbook I had bought while in Paris, “Paris Boulangerie – Patisserie” by Linda Danneberg and felt that Bastille Day was the perfect excuse. My co-workers loved the cream puffs and chocolate eclairs I made that year and a Bastille Day (or Cream Puff & Eclair Day as they called it) was born. Three roles and five years later, I hate to admit that I’ve slacked off the past few years and haven’t made anything to celebrate. I decided that this year would be the year that I renewed the tradition since I just started my new role last week and everyone has been asking when I’d be bringing in the delicious treats they’ve heard so much about! While I hope that you’ve all tried cream puffs and eclairs, I know many people never attempt to make them because they seem rather intimidating. I’ve found, however, that with the right recipe they are a lot simpler than they look. You start out with a basic pâte à choux recipe. Pâte à choux or cream-puff dough is the basic pastry dough used to make cream puffs and eclairs. My favorite recipe comes from Au Péché Mignon Patisserie which is located just outside of Paris, but if you don’t own a copy of “Paris Boulangerie-Patisserie”, I recommend going with Julia Child’s recipe which is very similar. Once your pâte à choux is ready, pipe circles onto a parchment lined cookie sheet and coat each one with egg wash. The cream puffs start out in an oven that’s 450°F for about 10 minutes or until lightly colored and then the temperature in the oven is reduced to 350°F for an additional 20 minutes or until the pastries are golden brown. After the cream puffs have cooled, it’s time to fill them. I prefer to use whipped cream for my filling even though some recipes will call for pastry cream. 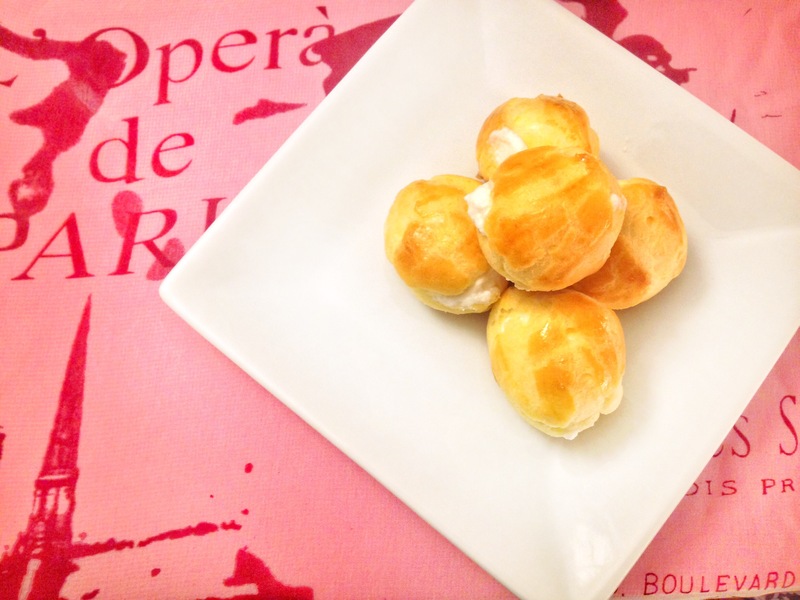 To fill the cream puffs, I fill a pastry bag fitted with a small round tip with the whipped cream and then use the tip to poke a hole in the pastry and fill until no more will fit. The end result is a perfectly filled and delicious cream puff! 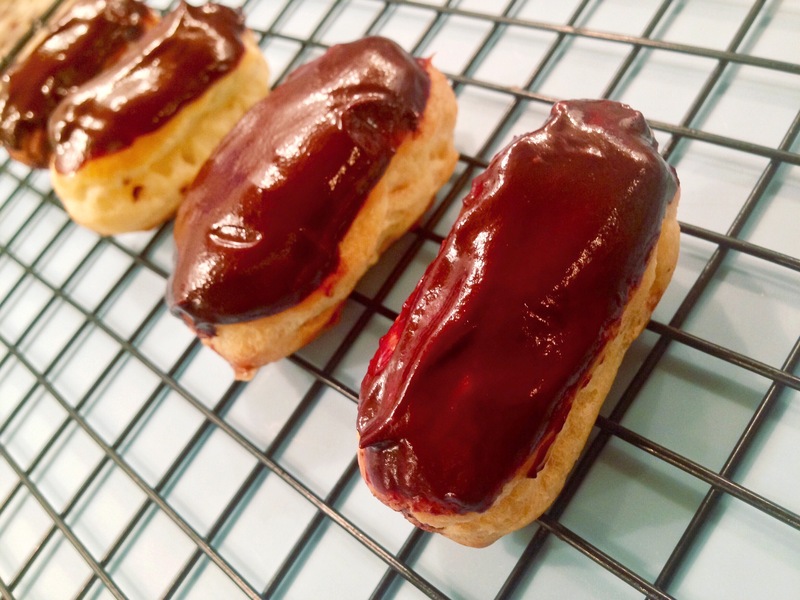 The chocolate eclairs use the same exact pâte à choux and baking instructions as the cream puffs. The only difference is that they are piped into lines instead of circles. While you’re eclairs are cooling, it’s time to make the pastry cream that will fill them. Martha Stewart’s recipe for pastry cream is very similar to the one I used. Once your pastry cream and eclairs have cooled, it’s time to fill them. Even though some recipes call for cutting off the top of the eclair to fill it, I think it’s easier to fill them in the same way I fill my cream puffs. Once they are filled, the only thing left to do is dip their tops in chocolate ganache to get that classic chocolate eclair look!